Important info to know if you live in South Mansfield and Venus TX -DME answers the big question - WHY ? Texas has by far the largest population at risk from damaging quakes caused by energy operations, the government says.But unlike Oklahoma, Colorado, Kansas and Arkansas, Texas has yet to acknowledge that many of its earthquakes are probably man-made. On May 7, 2015, a magnitude 4.0 quake shook the town of Mansfield, southwest of Dallas. It was the strongest earthquake ever recorded in North Texas. Railroad Commission staffers arrived to check gas lines and drilling rigs. But what interested everyone most were the five disposal wells, pumping thousands of gallons of wastewater a day into the ground near the quake's epicenter.After ordering the operators to conduct pressure tests, the agency said there was "no conclusive evidence" linking the earthquake to energy operations. But behind the scenes, top commission staff pored over the well data. They noticed that at least one of the wells was injecting very close - if not directly into - a layer of earth nearly 2 miles deep known as "the basement." That practice had been implicated in a 600-fold increase in earthquakes in Oklahoma. The agency required the operator to alter the well to make it shallower. The first public mention of the requirement came nearly a year later. And nowhere does paperwork obtained by The News through an open records request give any reason for the action. The agency recently said a second well was also altered. AUGUST 1, 2016 5:17 PM; BY MAX B. BAKER, Star telegram.com; Cross post August 6, 2016"
"EagleRidge Operating will continue using gas-powered lift compressors on its gas wells until Dec. 1, but Mansfield will require 24-hour a day monitoring to make sure the company complies with the city’s ordinance. April 31, 2016. Posted by Admin. ​The above Flir picture is from an Eagleridge lift compressor 6 months into the temporary permit. It is located by Mansfield Performing Arts, Ben Barber and Donna Shephard. Across the street from Our Place restaurant. Eagleridge has asked for a variance permit to continue polluting for another 6 months while the company decides if they will go permanent and enclose and electrify these compressors. If he were a prudent operator, this decision and efforts to complete the tasks would already have accomplished. April 31,2015. Posted by Admin. ​This is a flir of a tank located across the street from new home development in south Mansfield. Buyer Beware! MANSFIELD HOMES WITHIN 100 FEET FROM GAS WELLS! The Mansfield City Council voted 6-1 on April 27, 2015, to allow new homes within 100 feet from a gas well. Video of the discussion starts at 41:30 here Mansfield, Texas On Demand – Powered by Granicus.com. This vote happened despite warnings of known problems discussed during the council meeting. City passed regulations on O&G drilling. Barnett Shale group took issue with three elements of new local regs, submission requirements for: (1) an AQ Mangament plan; (2) gas analysis; and (3) a produced water analysis. Industry sent letter expressing opinion that regs were preempted and city had sit down meeting with 12 operators. When asked why they thought was not preempted—not CR? ; effectively prohibiting O&G development? ; not surface based?—Industry answered: none of the above. Industry felt these were “preempted by other law” because all were areas already regulated by the RRC and purpose of HB40 was to clarify and protect RRC regs. Industry opinion is that HB40 clarifies exclusive auth by RRC, and the only auth given back are only in areas not already regulated by RRC. It has been one year since Summit Patrners took the mansfield Compressor Mega Station behind the Performing Arts Center in Mansfield. For 3 years, Mansfield citizens complained of oily property splashes, odors and noise coming from this nearby compressor station. When residents asked TCEQ and Mansfield Gas Well inspector to investigate a spill that splashed across homes and into the creek next to the station, residents were told that the material either originated from the pickle factory( Mansfield's story) or insect activity (TCEQ story). However, neither found any violation at the site. The ducks knew better--they left the creek and began to reside in homeowner's pools. When residents made inquiries to TCEQ about maintenance records for the site, they were sent a blank sheet. MGWA met Summit Partners during a work session with the City Council for drafting protective ordinances. They heard our complaints and promised to be a better neighbor and operator. It has been one year since Summit took over. They made good on their promise to the tune of $534,000 to make repairs, inspections and remediation of soil that filled 4 rolloff container trucks. See what happens when someone listens? Attached is the list of upgrades, repairs, remediation and future systems implementation from Summit. On August 5,2015, Mansfield Gas Well Awareness sent the letter to Mayor David Cook in an effort to get the Mansfield City Council to address the lack of reciprocal setbacks(see home page). In our city, the reciprocal set backs default to 100 ft from from protected use to gas well. The picture to the left show such a home being built so dangerously close to a ga swell boundary--less than 60 feet away. This home is built in the "no smoking zone" of the gas well site. Imagine cooking out in this back yard! How many of you read about the Arlington incident involving a leak that evacuated homes within 600ft of the well. Homes like this have no accident zone. While many people say that it is the homeowners responsibility to know where they are building, they may think it only a quiet industrial site with a fence around it. The "right to know" is a basic civil right that all citizens have and understand. This builder is not required to disclose information. So that you know--- this gas well site has been permitted for over 20 wells to be drilled. Our citizens deserve better! Woodland Estates residents can breathe a little easier. That’s because Summit Midstream, operator for the Lonestar compressor site, has completed construction of two combustion units at the natural gas compressor station located between the Woodland Estates neighborhood and the MISD Performing Arts Center (inside the two large metal buildings just south of Killian Park). The units were custom built with an internal flare designed to improve air quality by burning off combustible chemical by-products found in natural gas. One unit flares emissions from the glycol dehydrator, which is used to remove moisture from the gas stream, and the other unit flares emissions from the produced water tank that contains wastewater from the wells. The units will not eliminate all emissions or odors but they should significantly reduce the amount of air pollutants being released off-site, such as volatile organic compounds (VOCs). The extraction of natural gas produces air pollutants such as VOCs that can adversely affect human health and was one of the reasons the Mansfield Gas Well Awareness (MGWA) group was formed. Although concerns related to urban gas wells remain, the new units are a step in the right direction, providing a better balance between the health and safety of residents while developing energy resources and providing economic growth. It should be noted that the new combustion units are not required by state or federal laws and were installed by Summit Midstream voluntarily, in large part due to the efforts of MGWA members. City Council Approves 35.5 acres of commercial and industrial area to be rezoned into housing development: Action item 15-1297. But guess what--the new neighborhood will have homes built as close as 100ft to a gaswell patch. Looks like the road coming from the gaswell site will also be routed through the neighborhood. This new housing will be just south east of Annette Perry elementary. This housing development will build homes from the 1,800sq ft range and is subject to the 300ft from gas well information that the developer must disclose to a homebuyer. On 5.11.15, Mansfield City Council approved the 3rd and final reading for Debbile lane Lease. This means that the 7 acreas between a pvt school, homes and assisted living on Debbie lane will begin its metamorphosis into a gas patch industrial cite complete with compressor station, blowdown stack, storage tanks, pipelines, ongoing truck traffic and drilling/fracking up to an additional 34 more wells. The additional issues will include Mansfield's limited control over what goes on at this site. With both HB40 limiting local municipality control and SB 709 limiting a citizen's ability to contest industrial questionable practices, Debbie lane just over 400ft away from homes and a school will be at the mercy of the State to provide protective oversite. Stay tuned! The third and final reading of the new Gas Well 114 Ordinace was heard with at least 25 speakers commenting. This debate and work session negotiations have been ongoing for since 2013. The final debate on how to protect citizens without impacting gas production has indeed been the fine line. There has been the worry as to not dare allude to anything that would reflect in any form or fashion an interpretation of a "BAN." Defacto Ban is the new word now that industry is using if anything appears to be over 600ft. It was heard from one of the council members discussing Mansfield's ordinances at a house committee meeting that we dont nee"excessive setbacks of 1000ft to 1500 ft." So one would have to ask, what makes these number "excessive" and who decided that? Despite not budging off of the 600ft setbacks between protected use and new permitted gaswells, Mansfield City Council unanimously approved tighter restrictions on gas well drilling. Mansfield City Hall saw a full house on Monday night. This second reading saw big gas business attendance such as Ed Ireland from Barnett Shale Energy Education council , XTO -- Walter Duease(some of you may recognize this name from the Pappy Elkins OOps we didnt mean to deplete this lake and sorry that I used a fake permit)and of course Edge Resources all in line to fill out a yellow card to speak to council about reasons for not allowing any setbacks.This included look at the millions of dollars, jobs and business gas wells generated here. Still--Interestingly, several weeks ago a Mansfield City councilman emailed " what 3rd parties do or don't do are not a concern to us. We are focused on the path the City has taken which is to focus on the local stakeholders and keep ALL outside influences at arms length during this process in order to focus a solution that is right for Mansfield." Didnt look like that was happening on Monday night. Many concerned residents came forward to give testimony about their concerns with the gas wells and need for better setbacks. These individuals ranged from being a member of the Mansfield PTA committee, two local environmentalists that work for state agencies, homemakers, healthcare workers and many others. A petroleum engineer spoke about the real hazards of having these gaswell heads so close together that a fire could lead to loss of control of the site leaving surrounding homes and people in harm's way. Of course a representative from the business community stood and re-read her previous statement from the 1st reading about the jobs, money and economic values to not wanting to move the buffers any more than the 600ft as they are at now. Still at the end of the night, council did not budge off of the 600ft setback. They think if it is good for Arlington, Grand Prairie and FtWorth, its good enough for Mansfield. While the ordinances are in the right step, the buffers have been an initiative all along--and are needed. These buffers are needed to increase distance between protected use and gas well sites for safety from potential fires, blowouts, blow downs, noise reduction ,odor, fumes and emission dissipation before reaching homes. The concerned citizens are asking for 1000ft buffers for any new special use permits, expired permits--the next 500 wells. This asking is not related to a ban or a taking. Doesnt affect vested rights, mineral right holdings, jobs, school setback, or businesses. Nada---Zip-Zilch. It does represent a change that Industry is very much against. So much against that they have been instrumental in the push for a plethora of legislative bills that will strip away local control by municipalities. Now--this could be the real reason City wont budge off the 600ft setbacks? Stay tuned for the third hearing on March 23rd at Mansfield CityHall. Both the Mansfield City Council and the Mansfield Independent School District have passed resolutions expressing opposition to the opening of the medical waste facility opening within the Mansfield Industrial District. TCEQ is responsible for approving RedAway's permit request. We all know what that means! Little to no oversite and no violation citations. When asked if RedWay had contacted the city about locations of nearby schools and homes before requesting a permit for the purposed site, CEO Joshua Smith responded "no." Emissions from any source that can be toxic to our families and children are veiwed by many Mansfield citizens as not acceptable. Even the city council is trying to work on scrutinzing the application for any cause for a motion to overturn. Saturday March 14th, members from Bethleham Church, MGWA and organizers for the Go Away RedAway group came together on Saturday morning to protest the site and apply pressure for the CEO Justin Smith to take his hazardous waste buisness elsewhere. For almost a year, Mansfield residents have been trying to rewrite their city's drilling ordinance to better reflect the science surrounding the public health consequences of heavy industry taking place so close to people. During this entire time, and countless appearances before their city council, there has not been one Mansfield citizen who came forward and defended the current approach. -Industry hired a sleazy push polling firm to conduct a Mansfield campaign by phone that purposely misleads about the impact of the revisions to the ordinance being sought and makes personal attacks on the residents pursuing those revisions. Sent in trade association speakers from Austin and Fort Worth to Mansfield to further mislead the business community about the revisions being sought. Set up an e-mail site where industry employees, no matter where they live, send their comments to the Mansfield City Council, in opposition to any revisions. Residents in this Fort Worth suburb seeking a more modern approach to gas industry regulation seemed to have hit a raw Barnett Shale nerve. A decision last month by the city council to postpone permitting of a giant new multi-well and compressor facility in Mansfield, pending development of a new gas ordinance, has spurred the largest and most expensive industry PR offensive since the fight over the Denton fracking ban vote last November, including a city wide “push polling” campaign that contain ad hominem attacks on local advocates. 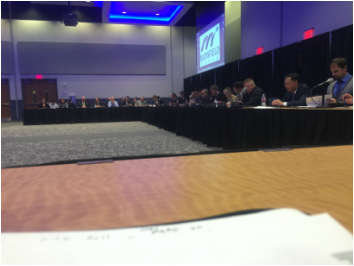 Although Bounds group began meeting in June 2014, and a city wide forum on a new gas ordinance was held in December, it’s the unanimous January 26th tabling of Edge Resources’ huge, 34 well, compressor, dehydrator, and storage tank complex by the Mansfield city council on its third and final reading that apparently has the industry worried they’re losing their influence in a town so deep in the Barnett Shale. Despite these scare tactics disguised as a “survey,” no part of the ordinance would affect current facilities. It’s aimed only at new permits. Residents have requested better monitoring and enforcement as well as a more protective 1500-foot setback from homes, schools and other “protected uses” to replace the 600-foot setback requirement established in 2008. Besides Promark’s push polling, which no trade group has yet claimed responsibility for, industry representatives are also suddenly showing up in Mansfield trying to drum up supporters among the local business community. This Friday, Austin-based Luke Legate of the “Joint Association of Oil and Gas Education Initiative” is speaking to the Mansfield Business Association. The Initiative is a state wide industry trade group alliance that includes the Texas Oil & Gas Association, Texas Royalty Council, Texas Independent Producers and Royalty Owners Association, Panhandle Producers and Royalty Owners Association, Texas Alliance of Energy Producers, Foundation for Energy Education, Texas Pipeline Association, Permian Basin Petroleum Association, and the South Texas Energy & Economic Roundtable. He’s never appeared before the Mansfield City Council. Next Thursday, it’s Ed Ireland, Director of the Barnett Shale Energy Education Council speaking to the entire Mansfield Chamber of Commerce at the Walnut Creek Country Club. The BSEEC describes itself as “founded by consortium of leading Barnett Shale production companies.” He was invited to the December forum that kicked-off the review of the new ordinance, but has not appeared at any of the regularly scheduled council meetings where gas was a topic since then. Monday’s city council meeting will feature the “first reading” of a proposed ordinance and include a public hearing on its contents. While Mansfield Gas Well Awareness members say they’ve been pleased with the progress on some issues of concern to them, two of the most important, reducing harmful emissions and longer setbacks, have not been resolved to their satisfaction. Last month, they reminded the city council that Mansfield officials originally called for 1000 foot setbacks in 2008, but those got reduced after intense industry lobbying. By now, if you are a current reader of this website, you know about the recent conversations regarding the Mansfield Compressor station and that of a blowdown caught on video. One of the BOD members of MGWA has been trying for over a year to get information from TCEQ regarding the application and permitted emissions approval granted Mansfield Compressor station at time of building. As luck would have it and his persistance, TCEQ sent us a copy of the original application with permitted emissions( contained under "Documentation" on this website). And oh my! The approval has been given for 52 scheduled blowdowns a year PER engine. We have 2 engines--so 104 scheduled blowdown events. This does not include the unplanned--related to power outages, or those due to faulty equipment repairs. Then, there are all the potential VOCs that accompany the blowdowns. Or worse --any fine mist water vapors that could be in the blowdown that could carry a mixture of chemicals and particles in the air to splash or spill onto property. Sharon Wilson says it best when she tells us to "hold your Breath Mansfield. Read her article here. What exactly does a Blow Down Mean to Mansfield Residents?? They are a designed as a safety mechanism that relieves pressure within the compressor system by releasing a mixture of existing material (methane, gas , Ethane , Benzene, etc) from the piping/pipeline through a valve as a gas plume that can project upwards to 30­60 meters in the air and last for 3 minutes to several hours depending upon the event that caused the release. One blowdown can emit 15MCF of gas on the average. Associated Health Risks: An exposure to a blowdown would have different health implications than a long­term lower level exposure (ie, yearly average) to the same contaminant when the compressor is online. On Wednesday evening, Jan 28th, several residents living near the Mansfield compressor made complaints to TCEQ about awful smells in the air. Thursday, Jan 29th , Sharon Wilson had traveled from Denton for a 9am appointment to speak at the EPA public hearing for a new ozone standard. Irwin contacted her about the odors and she agreed to come flir the area after speaking. They arrived at the site about 10:30 am. And what she saw was the mother load of emissions coming off that vent stack like she had never seen before. What she was recording was a massive "emergency blowdown" (versus the "planned" kind). While Wilson was recording,she became overwhelmed by the obvious hydrocarbon fumes. Such a blowdown was exactly what Lance Irwin had warned the Mansfield City Council could happen to the Debbie lane area. And he is right! This is why we do not need industrial uses next to our schools, homes, parks or-- really any protected use. Unplanned events like this blowdown for 2hrs+, recent gas leak for 5hrs, airborne foam falling like snow in neighborhood yards , mysterious oily film splashed across the back of homes and air so thick with fumes that you can't sit in your own yard ---are just a drop in the pan for reasons we do not need industrial uses operating next to our homes, schools, daycares , parks--or really any protected use for that matter. Our local government has the responsibility to protect us. To have ordinances that provide protective setbacks and monitor for a safe and healthy environment. Now the city has the video--hopefully they understand the message that Irwin was trying to convey ---only a few short days ago. There was a decent turnout last night at the council meeting. There were several that spoke before the council and those that filled out a bluecard for oppositon to approve the Debbie Lane expired SUP. Downwinders at Risk, Jim Schermbeck was there in support of MGWA and spoke to the council. He put them to shame for their lack of transparency with making closed door deals with industry while promising to work on a complete overhaul of the gas well ordinances with MGWA. Edge was there to represent their cause for drilling 34 more wells and placing a frack pond on that small site. There was no talk about the economical advantage to drilling that many well nor if the cash flow will be great. What wasn't anticipated was the fact that Edge intends to carry produced water, sand and other material to and from the site via east bound debbie lane all the way to 360. So-- past the busy Walnut Creek road (major school intersection) past the homes,and all the businesses up to 360. What a parade that will be going all the way up. Traffic will be something--hopefully they dont splash anything on anyone while carting the stuff out. The kicker is that the city will saddle that area with all the drilling and fracking of 34 wells for years. Conservatively-- if it takes 1 well to drill and frack over a 3 month time frame, it will take 8.5 years to complete. Now add all the day to day operations on top of that. The city did talk about a 2 for 1 special. If they do that, the area will have the possibility of 2 wells fracking or drilling every 3 months for 4.25 years. I guess choose your poison--right? After all the speaking and all the questions--the City still voted 6-1 to approve a 3rd reading.Daryl Haynes voted against. At the end of the meeting the way the SUP will operate is very different from how it started out several weeks ago. But at the end of the day and when it is approved, that landscape and the homes, schools and businesses around it will never look or be the same again! Thursday evening, January 8, Mansfield Gas Well Awareness met with City appointed subcommittee for what we thought were the beginings to the process of looking at the ordinances and making recommendation. Instead, the City had taken the model ordinance that MGWA presented at the Dec 3rd meeting and created a line item comparison of what Mansfield had as an ordinance and what MGWA was proposing. The session lasted over 4 hours with give and take. MGWA gave substantial explanations of the need for revised ordinances and what other city had them. Then, the provision was either considered for addition, modification or struck in favor for current ordinances. Some of the key areas of success for consideration were baseline testing and continuous air monitoring. The subcommittee agreed to consider provisions for specific evacuation and emergency plans, better education and notification to the public and a public scorecard for operator incidents and action plans. Considerations will also include increase in gas well inspector visits, a better checklist to review upon gaswell inspections, noise mitigation, public water utilization during drought season and detailed exhaust equipment specifications. What is left on the table, are pipeline improvement ordinances as the committee felt that this was already regulated appropriately and the need to increase setbacks between gas well site and homes, schools and parks. Protective setbacks is one of the most important measures that MGWA is seeking from the City. Stephen Lindsay, a subcommittee member, referenced Fort Worth Natural Gas Air Quality Study Final Report (conducted July of 2011) as the rule Mansfield finds is a good legal basis for substantiating setbacks. However, this study was not based on epidemiological evidence for health impacts, but rather statistics gathered and estimated numbers used from state regulatory mandates. There are many inconsistencies in this report regarding the methodology and the particular sites used for sampling. The study's costs and information contained was questioned by both Ft Worth environmental lawyer, Jim Bradbury and House of Representatives, Lon Burnam. Ft Worth ISD did not model their recommendations using this report. MGWA did bring to the committee's attention, the 2008 initial subcommittee for development of the original ordinances, did in fact include schools and daycares(along with hospitals, nursing homes and correctional institutions) for a provision within 1000ft setbacks. However, several operators were very vocal with opposition to the inclusion of schools and daycares into the 1000ft setbacks. Therefore, schools and daycares were struck from the provision. Since 1000ft has been tested for legality and was on the books at one time for schools and daycares, MGWA has asked that this protective setback be explored again and put into the ordinances. The committee agreed to review. All of the recommendations will now be processed and presented to industry to review. Based on the revisions made and verbiage written, the subcommittee will present to the City Council for voting. MGWA has asked that we be informed of any exclusions and be updated on progress. MGWA will follow progress on the proposed protective setbacks and continue to press for this inclusion. On the morning of December 21, the residents of Woodland Estates awoke to what appeared to be just another overcast day, but many who ventured outside were immediately hit with an unpleasant odor. MGWA representatives immediately called Summit who quickly dispatched a technician to investigate. Although Summit's report on the incident did note faint glycol odors when they arrived onsite and favorable wind conditions to carry those odors to the Woodland Estates, the report also indicated possible wood burning in the area as the source, however MGWA believes the odors originated from the compressor station. It is worth noting that weather conditions at the time were ideal for an inversion, which is a meteorological term for low lying clouds that can trap pollutants near ground level. This can allow even small streams of fugitive emissions to build up over time to significant concentrations. The fact that Woodland Estates residents live down gradient from the compressor station and that some gas emissions are heavier than air, likely exacerbated the situation further. We believe this event, yet again highlights the problem with locating gas wells that emit unhealthy fumes near homes, schools, and parks. MGWA will be making the City Council aware of this recent incident on Jan. 12, 2015, which is the second reading to authorize a new compressor station that's being proposed by Edge Resources on Debbie Lane. During the council work session on Dec. 3 with the City Council and Industry, a representative from Summit Midstream Partners announced that they had recently purchased the Mansfield Compressor Station from Texas Energy Midstream. After hearing our concerns at the meeting related to health and safety, Summit offered to work with us to find solutions. Since that time, MGWA has been working with Mr. Dakota Lee, Director of Operations for Summit, to investigate potential sources of the odors some residents have experienced on a regular basis. So far, the most likely source appears to be the sump tank, which collects condensate from the glycol dehydrator and various gas lines throughout the site. Summit's environmental team is currently looking at best available technologies to remove or reduce the odors. MGWA will continue to work with Summit to find solutions and push for the highest protection possible to ensure clean air for Mansfield residents. Just barely three business days after Edge attended a worksession that Mansfield City Council hosted on determining the need for an update Gas Well Drilling and Production Ordinance, their representative made a proposal on the very next scheduled council meeting (12.8.14), to resurrect an year old expired Special Use Permit(SUP) to grandfather back in all the original provisions for 36 gas wells, increase truck traffic, a compressor station, deydrator unit and frackpond. In other words, turning this acreage into a full blown Industrial site with all the bells and whistles! Problem is, this area hasnt seen any activity for over 4 years-- and limited at that with only 2 gas wells. There are alot of businesses, two schools and many homes that now surround this small site. Edge says this area is the "richest" in the Barnett Shale. If so, with only 2 wells in six years and with gas prices down--why now? The general concensus of " why now" is so that they can get in before (if any) the new ordinances come into play. Remember, Edge Resources had input into the original 2008 ordinances in which they were opposed to 1000ft set backs for schools and daycares because" children primarily are more mobile." That was swell of them and now they want to expand into full blown operations before they have to protect the people living around them. Further more--the City may actually entertain grandfathering the original SUP due to Edge promising to donate what acreage left to the city to develop a linear walking trail and park around the gas patch.Unless there is fence line monitoring, I would question the quality of air coming off those wells and compressor units while taking my family for a stroll along that trail. The City Council voted yes to hear the 2nd reading of this proposal January 12, 2015 at 7pm. Mineral rights or not, people need to consider this new permanent change to their environment and if puchasing it with a few mineral right dollars was a good buy- Click the file below to view the footprint. Wednesday night, Dec 3, 2014, ﻿Mansfield Gas Well Awareness led Mansfield City Council's "work session" regarding the need for rewriting the city's gas drilling ordinance. Of course, Texas Commission on Environmental Quality and the Railroad Commission, tried to project a "Don't worry, be happy" façade. MGWA had enough information from lists of violations, poor response time and skepticism to question their ability to effectively regulate and protect the citizens in Mansfield. If you were there, it looked like the odds of putting 3 members of MGWA to the far right side of the council with 13 gas well operators and regulators to the left, looked overwhelming in support for industry. However, when questions and answering session began, the city council elevated MGWA beyond anything we could have imagined, by allowing us to participate in direct conversations with industry, city attorney , identifying land use issues with planning and zoning and publically questioning state regulatory agencies regarding their limited resources and processes. Whether this exchange will lead to substantial changes to the city's drilling ordinance, remains to be seen. Interestingly, of the gas operators sitting at the table during the event, Eagleridge was missing. This operator is a main source of many complaints in Mansfield and the operator that sparked the Denton fracking vote controversy. But wait---Eagleridge's Chief Operating Officer Mark Grawe was present and hiding in the back of the room among the crowd! He was called out by City Council and asked to answer MGWA questions. It was evident from his answers that his company lacks the remote sensors, automatic cut offs and other safety precautions that other operators boast of. By the end of interrogating Mark Grawe and hearing how the other industry reps operate, it was clear that a consistent standard should be utilized so that an "industry best practice" would be updated and applied to all gas well operations. MGWA proposal for the 1500 setbacks to replace our current 600ft for public health and safety was redirected as being addressed through better incident /accident reporting rather than the need for substantial buffers that separate our citizens from industrial uses. However, we insisted that this be looked at thru better rezoning and landuse. Fire Dept response to need for better training and response time was "we don’t have the facilities to practice in." How to better regulate or reduce emissions from the compressors was not really answered. Instead they offered that the city can't regulate pipelines and safety of compressors. But did you know, they can regulate the noise , odors(emissions) and other forms of trespasses that come from these sources? MGWA presented the city with a model ordinance that combines the most protective aspects of drilling ordinances from DISH, Southlake, Dallas, Arlington and even Fort Worth. These ordinances have been legally tested by these cities, adopted and gas industry can or has enjoyed drilling and production within these cities without suing. This put the council on the spot for not having a legal excuse for updating the Gas Well Drilling and Production Ordinances. Mayor David Cook took note of the model ordinance . He said the city would look at the model, do a side by side comparison and come back in mid January to continue the discussion. Overall, the work session was positive. There was no jabbing or inappropriate criticism. We hope that before the council makes a final decision on what ordinances will be enacted on behalf of the citizens, that MGWA be afforded a date and time to meet, in a smaller venue, to discuss these changes . This gives all stakeholders closure and satisfaction that the overhaul of Mansfield Gas Well Drilling and Production is truly a combined effort by people, industry and local government for a lasting product. Please continue to visit our website and give support! Did you feel it? At least 30 Mansfield citizens felt and reported feeling the earthquake that hit Venus, on saturday. This earthquake registered 3.4 causing light to moderate shaking. According to the United States Geological Survey( responsible for monitoring earthquakes and the hazard program), seismicity other than from natural causes are triggered by human activities that "alter the stress conditions of earth's crust sufficently to induce faulting." These activites have been connected to injection of fluid into the ground and extraction of fluid or gas. This form of activity is called "Induced Seismicity." Read summary of M.34 Venus earthquake here. Mansfield residents are seeking tighter controls on gas drilling. Mary Lillard is just across the street from a double fracking operations taking place in SE Mansfield. Fracking includes a high impact force of injecting a combination of water, sand, and chemicals for the purpose of cracking or fissuring the shale beneath the ground to release gas. This process can take several months to achieve optimal results. There are two sites that are across the street from each other and located alittle over 800ft from Mary Lillard School that began fracking. 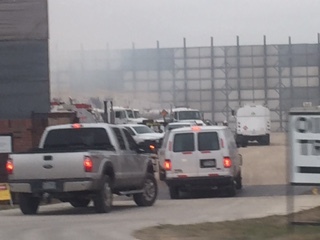 These industrial sites were busy Saturday morning with trucks lining the street to get into the area to deliver silica sand for the fracking. 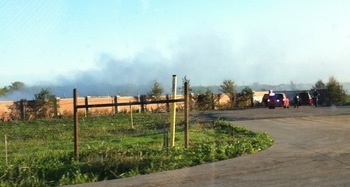 Millions of gallons of water are being pumped into the Frack pond behind the site. The west pad #57 was conducting double fracking with two engines going simultaneously(please see media for the sounds). These sites are subject to 7 am to 7pm operations Monday thru Friday; 9am to 6 pm on Saturdays and no fracking on Sundays. Unfortunately, the Frack engines are not subject to electrification, so the fumes will be bad. Anyone within1000ft of the site should have recieved a letter informing them of the intent of operations, including contact information, commencement and conclusion of operations. Contact the City Gas Well Inspector for complaints. But please do not forget to contact TCEQ EVERYTIME you smell odors, see smoke or think the emissions are making you sick. Batten down the hatches as there are 5 total wells to be fracked! Wednesday, October 29th is a night that many in the Mansfield community will remember. The conference room was packed with people from members of City government, school boad interest, former mayor of Dish, grassroot reps from other cities, physician group rep, sierra club, DFW Clean Air Network rep to home owners across all of mansfield that came for the evening to listen to health impacts that we face with these unregulated gas well . One individual is a manufacturer of gas monitors and traveled from Austin to hear these issues in an attempt to understand better how he can impact the environment with modification of his equipment . The presentation began with a Mansfield Gas Well Awareness introduction of who we are, why we are here, what we want and what individuals in this community can do to stand united for a better gas well drilling and production orinance. Next we had Dr. Epstein, MD, FACP from Lubbock Tx Board of Health present A Medical Perspective on Oil and Gas Development. Her presentation, the solid studies that she presented and the real health impacts that have been proven that affect those of us that live close to these sites were a revelation to all in the audience. One person comment "This is like a SciFi movie you watch on TV, but it is real." "Our personnel are not trained to resolve gas well incidents, only to recognize whether or not a hazardous situation exists, and to contact the gas well emergency number to get immediate assistance. When a fire officer arrives on scene of a gas well incident, he is to size up the situation to determine what may be going on with the well site. He will then contact dispatch to make notifications to the appropriate fire department personnel following our procedures on gas well response. ﻿On most occasions the Fire Department Gas Well Inspector is notified." "The air monitors we have are Multi-Rae lite 5 gas monitors. By "5 gas" we mean that they contain sensors which allow for 5 different measurements. LEL (lower explosive limits), CO (carbon monoxide), O2 (Oxygen), H2S (hydrogen sulfide), and HCN (hydrogen cyanide). The LEL sensor is calibrated with methane gas. You are correct that natural gas, or methane is almost undetectable in its natural state. In addition to these monitors, we also have leak detectors available. The Sensit methane detector. At the time of the incident, which this inquiry is in response to, we did not have leak detectors available on every first responding fire apparatus, only air monitors. We have since discovered some of the weaknesses of having only an air monitor. As a result, we have ordered Sensit leak detectors for all apparatus. These will be calibrated to detect methane and carbon monoxide." ﻿The concern remains that the Fire Dept is not trained and may or may not know whether a hazardous situation exists. a clarification in response to concerns that the required drill site setbacks create an undevelopable zone between the drill site and surrounding uses. The setbacks establish the minimum distance that the drill site must be kept from existing protected uses. Under the existing regulations, a drill site must be at least 600 feet from the boundary of a platted residential subdivision, and at least 600 feet from any other protected use. miminum 75-foot separation from a wellhead to public,street or highway." With that said, if the gas wells existed first, setbacks are set at a minimal of 100ft. Mansfield is already providing for new subdivisions around several gaswell sites in south Mansfield. As it stands now, there are no required disclosures that homes, schools, parks or day cares are built this close to existing gas wellheads. It appears that the incident last Saturday was more than just the gas wells letting off steam. EagleRidge gas well operator's crew repaired a leak at a hole located on a pipe fitting. An inquiry has been filed for an investigation by Texas Railroad commission for both well site and pipeline safety and Texas commission for environmental quality. Video has been sent to all pertinent parties. And an inquiry has been made with the fire marshal as to the Fire depts rationale for not calling either the gas well operator or gas well inspector when they discovered the leak at 3 am. A public records review has been requested to review all of the findings related to that event. The report will be posted when received. valves that caused the high pressure release of material into the air. have waited and how much material would have spewed into the air before they called someone? A debate comes from concerned citizens in Mansfield because of a proposal to use a 15,000 sq ft building to start up operations in the medical waste processing business. Residents are concerned whether it is safe to process and store 50 tons daily of medical waste coming as far as Lousiana to our area. TCEQ headed the meeting with assuring the residents that regulatory processes were put in place to be protective of the environment and the citizens living here. New Construction for Compressor off of 360. Also including pipeline that will extend from the site all along 360 west to Heritage Pkwy and then across to connect Mansfield Partners north and south pads. Very busy these days! Texas Railroad Commission-Who Permits and Regulates Gas Well Compressor Stations? posted by Admin August 2, 2014. This week Mansfield Planning II updated it's Gaswell Activity site to include the number of wells that have been permitted. This came after several attempts by residents to contact the dept for the number of wells that are in current operations and how many have been permitted. After 4 days of the city" looking into the matter", Planning II came up with an answer. Then, created an additional area beneath the Activity Log to contain that info. Kuddos for finally doing this! However, according to Planning II, " The City does not track whether the wells are in production as that information is filed by the operator with Texas Railroad Commission." Since the City doesnt know this information, how would they know when a well site becomes " uneconomical to operate and there is a need to plug and restore." How would they keep up with the accurate amount of dollars owed for City royalities? Perhaps Planning II could be more dynamic and take the lead from Grand Prairie's interactive gas well website? Now that's transparency! According to sources for City Planning II, the land Use Plan is a 'general planning tool" and there is no "ordinance or authority over development." Currently, the Plan has 350 acres slotted for gas and oil production, with 158.52(45%) acres of that scheduled to be in developed area. With 206 gaswells currently in operations and multiply the average distance for horizontal drilling underground, it is estimated that there is about 237 miles of drilling going on beneath the City of Mansfield. Furthermore, Planning II dept comments "there is no limit on the amount of land that can be used for any land use, including drill sites and related facilities." They go on to say, ""unlike other land uses, the drilling authority on most drill sites will expire, and if the sites become uneconomical to operate, they may be plugged and restored." So what will be left? What about an environmental impact? Who decides and is there really a Plan? Mansfield Gas Well Awareness Group Opens Up New Front in DFW Urban Drilling Fight. TCEQ scheduled a visit on November 26, 2013 to investigate Texas Energy Midstream LLC/Mansfield Compressor Station's compliance with the "Planned Maintenance, startup, shut down at Oil and Gas Handling Facilities "which became effective September 10, 2013. Findings for this compressor site revealed that no records for maintenance were available to give TCEQ. Unfortunately, TCEQ did not cite a violation for noncomplaince, but instead asked that Mansfield Comprssor Unit "please install a tracking system and submit by Feb 3, 2014." See results of compliance investigation under "downloads.". Section 114.13 (D) 7: The continuous noise monitoring equipment shall be capable of wireless transmission of real-time noise and audio data. Access to this real time data shall be available to the City inspector. Section 114.13 (B)An operator shall only use electric motors for purpose of drilling operations. Such electric motors shall be connected to a ground- mounted transformer located on the Drill Site or Operation Site. The City may approve alternative motor if the Drill Site or Operation Site is located more than 1,500ft from Protected Use or if electric delivery utility company reports that there is insufficient capacity to serve a Drill Site or Operation Site. 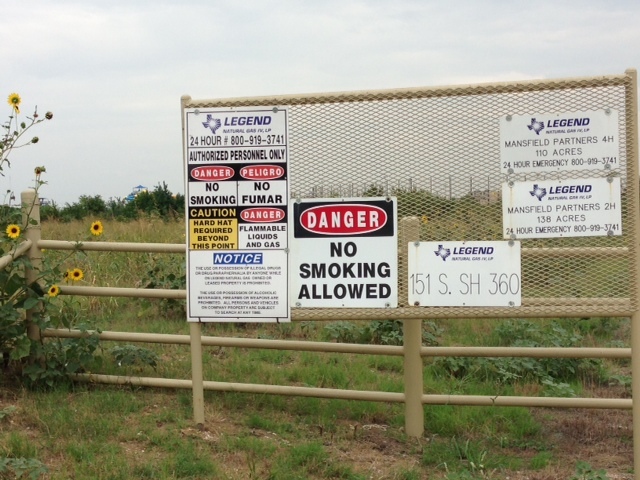 Eagleridge Gas Drilling and operations In Mansfield Texas--its impact on awareness of poor protective city ordinances and vague state regulations. Who is responsible? June of 2013, Eagleridge LLC petitioned for and was granted a permit from the City of Mansfield to commence gas well drilling and production on property as little as 700ft from a neighborhood. Eagleridge's unscupulous manner in which gas well activites occurred, set in motion investigation of regulatory requirements, citizen's rights, contacts with TCEQ and meetings with City Council to enact protective Gas Well Drilling and Production ordinances for all Mansfield citizens living next to a gas well site. Eventhough Eagleridge's toxic activities are well documented in reports, pictures and videos of repeated noise, time of operations and emissions violations, Eagleridge has yet to be fined. Why is that? Who is responsible? See the "downloads" for the reports and findings. According to the City of Mansfield 2012 Land Use Plan, 57 gas well drill sites have been approved throughout the city that will accommodate up to 512 gas wells. As of 2014, about 206 have been drilled. However, there is no evidence that an environmental studies impact or property value impact were considered for planning for gas well and oil production- only the financial benefit were given. Despite many voices protesting the approval of some of these sites, Mansfield City Council and Zoning approved these sites. Now our neighborhoods, day cares, and schools are existing beside these industrial use sites that go unregulated for controls for harmful air pollution, noise pollution, and use of millions of gallons of our water. City of Mansfield has collected millions of dollars in royalties from gas well production, yet $0 have been put back into the community for protective equipment, continous air monitoring; appropriate noise mitigation, adequate communication, or additional personnel to provide research for the health and safety of our protected use. No training for any major catastrophe. No adequate insurance coverage for the aftermath.